Aston Martin's new luxury brand has arrived. Aston claims the Lagonda brand will be the world's first zero-emission luxury brand "that can transport its occupants to remote and spectacular locations." Andy Palmer, Aston Martin Lagonda President and CEO said: "The Lagonda All-Terrain Concept adds a hugely exciting sense of adventure to the unique brand of luxury, emission-free vehicles that Lagonda is planning to produce. This is a car that would be at home whisking someone straight from a glamorous red carpet event to a remote scientific research lab. It shows the bold possibilities for Lagonda and demonstrates how the company will push to expand horizons in every area, whether it be technology, design, or scope of travel." The All-Terrain Concept evolves the design language last seen on the Lagonda Vision Concept. Lagonda says the original design took inspiration from the Concorde airplane and this new concept takes some of its design language from a superyacht. The surfacing is futuristic and there is a relaxed elegance emanating from the belt line. We think it looks great from the front but we're wondering what Lagonda was thinking with that frumpy back end - it looks like it has a massive growth. Rear end aside, the concept's proportions are great. Because it stores its batteries in the floor, the designers have been able to fit rear-hinged doors and include a rear-seat-biased limousine atmosphere inside. Since this is an ultra-luxury vehicle, the suicide doors may actually reach production. The front seats can also pivot around to face the rear seats in autonomous mode, a feature we doubt will make it to production. There's also plenty of glass in the roof to help maintain a more spacious cockpit. When describing the interior, Aston Martin EVP and CCO, Marek Reichman said, "We imagined that the owner would be a sort of pioneering yet environmentally conscious person. They may well have a luxury villa in a remote place that acts as their sanctuary. As such, the Lagonda brand is unconstrained by the traditional values of current luxury products, it is not about wood and leather, we tried to design the interior to feel very calm and quiet with soft, natural materials like cashmere. Lagonda reflects a future that is full of unique materials that are not set in the past." This is clearly still a concept so Lagonda didn't give any details about power or range from the electric drivetrain. Over 70 Welsh employees have now joined the team at the St Athan facility, which will expand to over 700 employees by 2020. 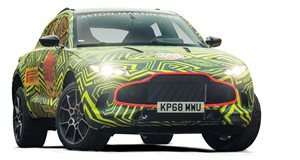 St Athan will be responsible for building the production Lagonda SUV as well as Aston Martin's own SUV, the DBX.